The Rachio app has a new look! Check out this article for details on what to expect with version 3.13 of the app. Our latest app brings new features and improved design to make smart watering better than ever. Read on for a high-level tour through the latest and greatest from Rachio. For details on the most recent releases, visit the changelogs for iOS and Android. For instructions on how to update to the latest Rachio app, go here. Note that Rachio 3.0 mobile app and higher requires a phone or tablet running iOS 10.3 or higher, or Android 4.4 or higher. Wind Skip. The newest addition to our Weather Intelligence family! Prevent waste by skipping waterings when high winds are likely to disperse water intended for your plants. 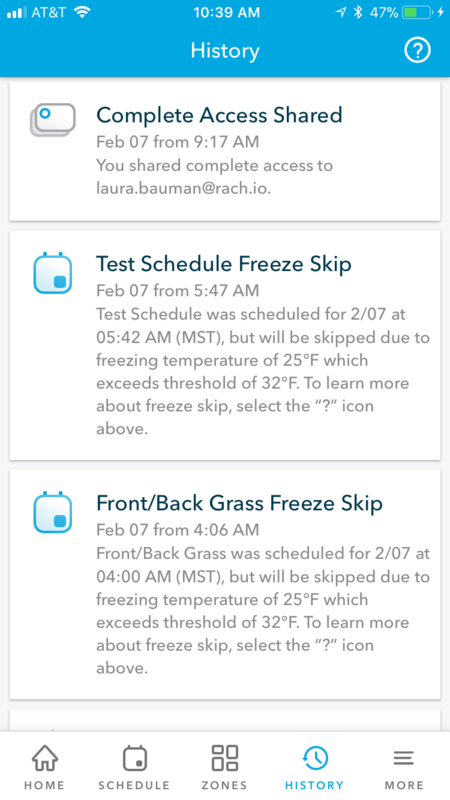 If wind speeds exceed your predetermined threshold, Rachio will automatically skip your scheduled watering. Learn more about Wind Skip here. Navigation Bar. Our new navigation bar (found at the bottom of your app screen) consolidates the most important pieces of the app into one place. Navigate with ease to Home, Schedules, Zones, History, and More! Quick Run remote. The Quick Run remote now offers more control than ever before! Need to manually pause a watering so your dog doesn’t get wet? Want to skip or re-run a zone during test runs? Looking to pause your sprinklers to save water pressure during your morning shower? Locate Quick Run (available within the Home screen in the “Home” tab) to explore these functions and more. Find additional details here. History. See watering history, Weather Intelligence skips, schedule updates, and controller updates all in one conveniently consolidated History feed (within the “History” tab). See more here. Saturation Skip. Our new name for the old Weather Intelligence favorite, Climate Skip. 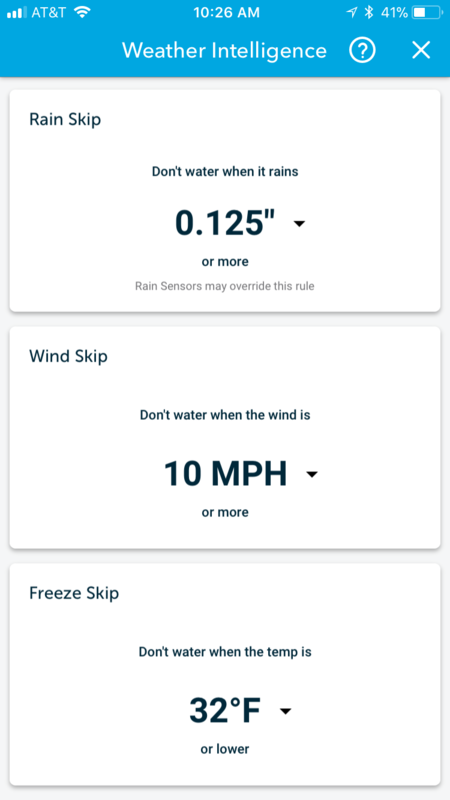 Saturation Skip uses zone settings like soil and vegetation type, as well as previous waterings and forecasted weather to calculate predicted soil moisture levels and skip waterings anytime your lawn can tap into available groundwater. Learn more about Saturation Skip here. Weather Intelligence. Saving watering is easier than ever! Update Weather Intelligence features on all schedules at once by selecting “Weather Intelligence” in the “More” menu. Learn more about Weather Intelligence here. Cycle and Soak. Our Smart Cycle technology, which prevents runoff and improves plant health, has been enhanced to water more intelligently. Go here to find out more. Account Settings. Need to make updates to your account? Edit settings under the “More” menu. Standby Mode. Shutting down your sprinkler system for the winter? Place your controller in Standby Mode to disable all active schedules while keeping your controller online to receive updates for next spring. Find this setting under the “More” tab, and learn more about Standby Mode and controller statuses here. Quick Run. Water your way. Quickly and easily run one or more zones for any time desired by selecting the remote from the “Home” menu. Log out. Find this under account settings in the “More” menu. Exact, minute-by-minute usage. Your usage is now automatically reported in minutes of run time for increased accuracy. For more information on estimated water use, or to change your usage to gallons, go here. Easily access our Help Center and recommended support articles from the "More" tab. Contact Rachio Support within the app! Tap the help icon in the upper right corner on any screen, then select “Contact Us” to submit a ticket. 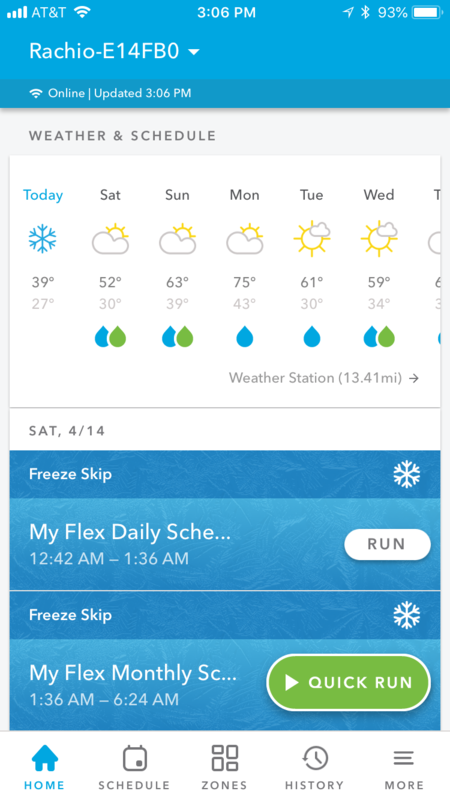 What's new with the Rachio app? How do I update my Rachio app?